Maximise profitability & reduce waste. Track all your recipe costs in one place while also accounting for packaging, logistics, employee & other production costs. What is a cost calculator? The cost calculator from Nutritics will enable you to track all your recipe costs in one place. In addition to ingredient costs, you will also be able to account for packaging, logistics, employee and other costs associated with product production to enable you to maximise profitability and reduce waste. Why? How will a cost calculator help me? The cost of food waste in the UK is estimated to be £2.5 billion each year*. This ‘food waste’ consists of plate scrapings, unused ingredients, in-edible food waste, the packaging used to store or serve the product and the resources required to produce it. This additional cost is on top of the many costs associated with food production and distribution such as the employee time spent producing/serving the product, the cost of warehouse space or fridge electricity used to store it or cost of the fuel used to transport the item to your customer. In the past, tracking all of these associated costs required separate inputs into multiple systems such as food waste scales, inventory trackers and ingredient ordering systems. The cost calculator from Nutritics will allow you to account for all of your recipe costs in one place, in your own currency and in real-time. That also means less time wasted logging into various systems, entering the data and then integrating the outputs into a useable format. What does the cost calculator do & how do I access it? The cost calculator from Nutritics is accessible on all recipes in your account. Step 1: Search for and add all ingredients and their quantities to a recipe. Then you can add the cost of each ingredient (ie. the price you pay (in your own currency EUR, USD, AUD, AED etc) per unit weight eg. £2.50/500g) and the total food cost will be automatically calculated. A recommended sale price will also be calculated based on the tax rate and profit margin % entered. Step 2: Access the cost calculator by adding in at least one portion / pack size to your recipe and clicking on the corresponding ‘Cost / RRP’ column. The subsequent pop up that appears will summarise the cost of the ingredients for that portion size and also allow you to add other associated costs for example logistics or storage fees into the predetermined categories. 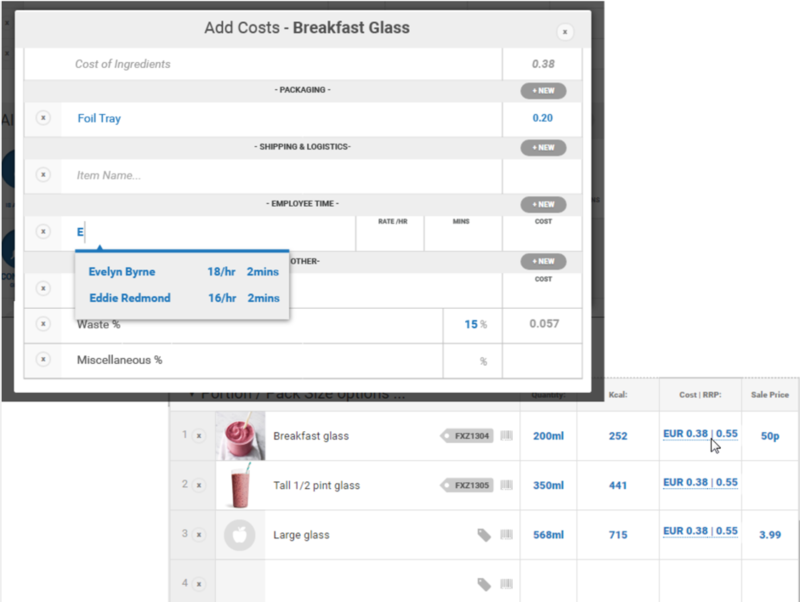 You can also add in your own categories and costs to ensure you get the most complete analysis of your product or recipe. When a portion or pack size is added, you can use the advanced cost calculator to account for the cost of the packaging, transport and employee prep time of that product. This enables you to generate a more complete picture of the cost of producing a recipe or product and allow to you make more informed decisions regarding sale prices. Who is the cost calculator available to? This advanced cost calculator is available to all Food Service users subscribed to a Plus or Premium Plan and all Research account holders. Why don't you try it now? Sign up for your free trial to the Foodservice Edition and explore the software to your liking! It's that simple! 2nd May 2018 Create Australian Food Labels in MinutesCountry of Origin Labelling and Health Star Ratings are now available in Nutritics. 24th Jan 2018 How to Fulfill EU Food Labelling RequirementsComply with new requirements using allergen management and nutrition labelling solutions.